…and that’s the World Climbing Calendar 2015! A bit of background: It all started 21 years ago with the Australian calendar for 1995. And then it transitioned to a World calendar in 2002. Every year for the last 20 years I have produced a calendar exclusively featuring my photography. It has been a great way of sharing my work and over the years the calendar has built up a strong following. Some years ago, for the 2007 calendar, I did something a bit different: in addition to producing my normal World Climbing Calendar 2007 exclusively using my photography (which was widely distributed internationally), I also produced an Australian Climbing Calendar 2007 using the work of several Australian photographers (and distributed locally). There were a few reasons why I did this: Firstly, I thought it would be a good thing for the Australian climbing scene if we had an annual Australian climbing calendar again (my one regret when I’d switched my personal focus to producing a World calendar). Secondly, I thought I’d be nice to support some other Australian climbing photographers. I was curious how much support there would be for a specific Australian climbing calendar. The result? Unfortunately there was actually a decline in sales in Australia that year. I was surprised, I thought the industry and consumers might have gotten behind it but clearly not enough people cared. An interesting lesson. I was a little disappointed; not for myself but for the scene here. Since the extra work and expense in producing a second calendar featuring other photographers work could not be justified, it was easier to continue working on my own exclusive calendar — which has continued to sell strongly through a number of outlets around the world. 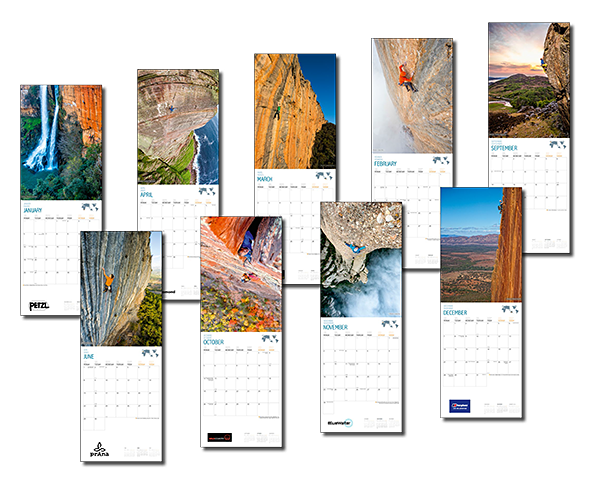 Fast forward a few years… For the World Climbing Calendar 2015, our 21st annual calendar, we decided it was time for a change again. So firstly, we completely redesigned the format (which incidentally had the benefit of allowing significantly cheaper postage rates without reducing size of the writing space). And secondly, I decided to reach out to three of the World’s best climbing photographers to see what we could produce in collaboration. Samuel Bie, Keith Ladzinski, and Lukasz Warzecha are three super hard-working guys who are dedicated to the craft, they travel widely and I admire their work immensely. So I was very stoked and honored when they all agreed without hesitation to work with me on this. It was a delight to sift through all the work that they submitted, and really tough to narrow it down to a final selection. 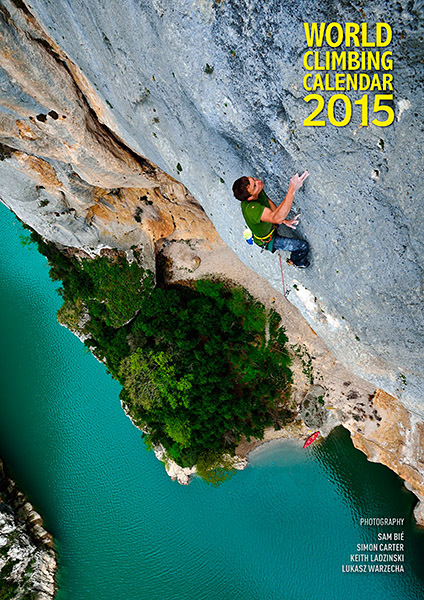 The World Climbing Calendar 2015 is the result. I just want to say thank you to everyone who has supported the calendar over the years — especially to those of you who have purchased it year after year. If you have any feedback on our new format calendar for 2015, I’d love to hear it. UPDATE: We have SOLD OUT, as have many of our overseas distributors. Copies may still be available from Mapiberia in Spain, JeGrimpe in France and Ruheabteil Gear in Switzerland.